Morris 4-Light superior architectural flood light in bronze color, features corrosion-resistant die-cast aluminum housing with architectural bronze powder coated finish. This flood light has four 120-Watt LED lamps that have voltage rating of 120 - 277-Volts and current rating of 1.4-Amps. Lamp has color rendering index of 81 and color temperature rating of 4397K to ensure optimal light level in the surrounding. Lamp offers 10321-Lumens of bright light output. This trunnion mountable flood light measures 17-1/2-Inch x 11-3/4-Inch x 4-1/4-Inch. It has more than 50000 hours of life span. 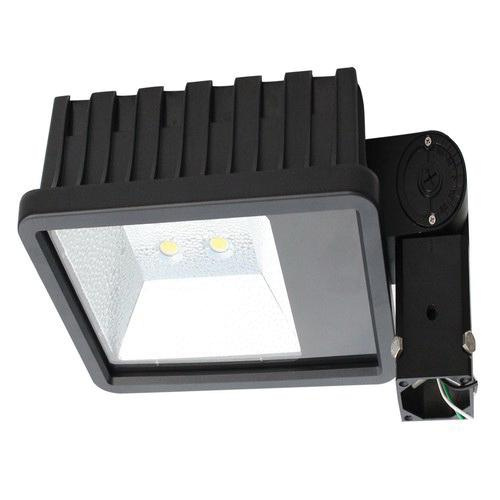 This flood light comes with water-proof and durable silicone rubber gaskets to seal out the dust. This flood light is ideal for wet locations. It has IP65 rated degree of protection. Flood light is cULus listed and DLC certified.